Microbial contamination still remains a major issue of the modern era, due to the widespread of drug-resistant pathogens. This has prompted researchers to come up with novel antimicrobial systems that could overcome antibiotic-resistance. In this context, nature can provide inestimable source of inspiration to design high-performance multifunctional materials with potent activity against drug-resistant pathogens. Actually, integrating the bio-inspired-approach with nanotechnology can provide cutting-edge solutions for drug-resistant infections. In this context, this review will examine recent advances in the development of bio-inspired antimicrobial nanostructures. Advantages of bioinspired approach to nanomaterials over conventional routes have been highlighted. Generally, bionspired synthesis can be carried out either by mimicking the functions of natural materials/ structures or by mimicking the biological processes employed to produce substances or materials. The review provides an overview of both strategies as applied to the synthesis of inorganic, organic as well as hybrid nanostructures. Antimicrobial efficacy and biological properties of these systems have been highlighted. Antimicrobial and antibiofouling nanostructured surfaces are also discussed. Keywords: Antimicrobial nanostructures, Bioinspired devices, Metal-based antimicrobial systems, Ceramic-based antimicrobial systems, Polymer-based antimicrobial systems, Hybrid antimicrobial systems, Anti-biofouling surfaces. Keywords:Antimicrobial nanostructures, Bioinspired devices, Metal-based antimicrobial systems, Ceramic-based antimicrobial systems, Polymer-based antimicrobial systems, Hybrid antimicrobial systems, Anti-biofouling surfaces. Abstract:Microbial contamination still remains a major issue of the modern era, due to the widespread of drug-resistant pathogens. This has prompted researchers to come up with novel antimicrobial systems that could overcome antibiotic-resistance. In this context, nature can provide inestimable source of inspiration to design high-performance multifunctional materials with potent activity against drug-resistant pathogens. Actually, integrating the bio-inspired-approach with nanotechnology can provide cutting-edge solutions for drug-resistant infections. 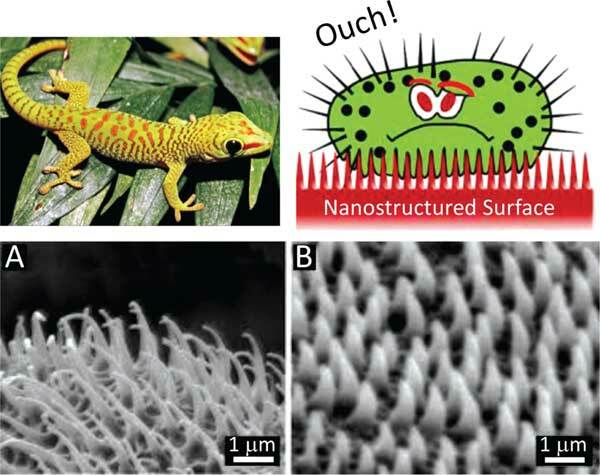 In this context, this review will examine recent advances in the development of bio-inspired antimicrobial nanostructures. Advantages of bioinspired approach to nanomaterials over conventional routes have been highlighted. Generally, bionspired synthesis can be carried out either by mimicking the functions of natural materials/ structures or by mimicking the biological processes employed to produce substances or materials. The review provides an overview of both strategies as applied to the synthesis of inorganic, organic as well as hybrid nanostructures. Antimicrobial efficacy and biological properties of these systems have been highlighted. Antimicrobial and antibiofouling nanostructured surfaces are also discussed.